Nokia has so far launched three Android phones this year named Nokia 6, Nokia 5 and the Nokia 3. Now, all these are affordable phones and come in the ‘budget smartphones’ category, but still, the company is going to launch an ultra-affordable phone that will be even cheaper than the Nokia 3. We are talking about the Nokia 2, which will be the cheapest Nokia’s Android phone of 2017. 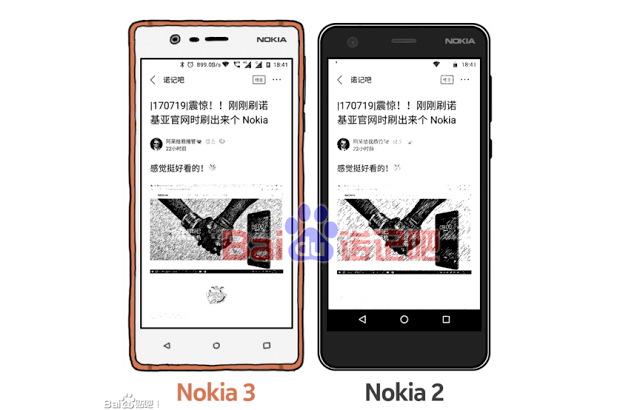 Today, an image surfaced on Baidu that shows the render of Nokia 2 placed next to the Nokia 3’s drawing. As you can see in the image above, the Nokia 3 and 2 differ from each other by the placement of the navigation buttons. On the Nokia 3, there are touch capacitive keys whereas, in the case of the Nokia 2, there are on-screen navigation buttons. The display size of both the phones are same, so just like the Nokia 3, the 2 has a 5-inch display.It is said that the phone has same design from the rear as of the Nokia 3. Also, since it is going to be an ultra-affordable phone, Nokia surely won’t use the Metal build for it. We tried editing the drawing a bit that resulted in the render above, and that is surely how the Nokia 2 is going to look like. It is said that it will be packed with a MediaTek chipset, but some sources also suggest Snapdragon 210 processor. Let’s hope to get some more information about the phone in coming days. If you remember, the Lumia 620 had the same design from the back with the similar looking camera module and rear facing speaker. The only thing that is different is that Nokia 2 is taller and less curvy than the Lumi 620. Again, we are still believing that Nokia won’t use the metal build for the Nokia 2. Was* 🙂 I don’t think it is the same as it was before.